We’d love your help. Let us know what’s wrong with this preview of The Honest Truth About Dishonesty by Dan Ariely. Does collaboration make us more h The New York Times bestselling author of Predictably Irrational and The Upside of Irrationality returns with thought-provoking work to challenge our preconceptions about dishonesty and urge us to take an honest look at ourselves. To ask other readers questions about The Honest Truth About Dishonesty, please sign up. In one sentence, what was your key learning from the book? I know someone who tells the most outrageous lies as if they are simple fact. I often wonder if she thinks the rest of us actually believe her, or if she is even aware that she is in the midst of telling a lie. Does she believe herself? These are the things on which I'd like some input. Is this the book for me, or should I look elsewhere? Kitty Katt I think chapters 6 and 7 of this book might offer some insight into the person you describe. A few years ago I read Predictably Irrational – a book that remains one of my favourite books on Behavioural Economics. The research reported in that book has just about everything going for it – it is amusing, fascinatingly interesting, clever and fundamentally undermines the core dogma of our age, that we are economically rational agents acting purely on the basis of our own enlightened self-interest. His next book, The Up-side of Irrationality wasn’t nearly as good, but it did report his 'outsourced research' conducted in India on the effects of providing large bonus pay for performance. Which is something that is better explained in Dan Pink’s book Drive. All the same, this research alone is worth the price of the book. It does much to explain the current mess we are in and even gives some indication of what we might want to do to get back out of that mess. His latest book, this one, is probably a better read than the last one, but suffers from the fact that I’ve now heard most of this research before. However, where this book really succeeds is in how it goes about explaining the consequences of this research - that is, in the story it tells. Essentially, we are all cheaters. The thing is that we do not cheat at every opportunity, as standard economic theory might have us predict, but rather, we cheat just enough so that we can go on considering ourselves to be overall ‘good people’. This is why we are less likely to cheat when reminded of the Ten Commandments or even other ethical frameworks that we don't even believe in. This is also why you might have more luck in retrieving money you left in a communal fridge than a can of coke you left there. People tend to be less ‘moral’ with the greater distance from money the thing they are ‘borrowing’ has. This also includes ‘cheating’ on tests and tax returns when the end result will be us being given money. But the most interesting research in this book, I thought, was that conducted with people who were told they were wearing fake or real designer sunglasses. Dan found that if you thought you were wearing fake sunglasses you were more likely to cheat on other tests they got you to take. The reason being that such sunglasses are purchased as a kind of display of status – meant to display of the wealth of the owner. Wearing fake sunglasses of this type – ridiculously expensive bits of plastic purely designed as status symbols – is a kind of lie, but unlike other lies we tell ourselves, it is a soul destroying one. If we take the can of coke from the fridge it is an act which is over in no time and we can probably rationalise our action – remembering back to the time we lost food from a communal fridge or something similar. But with fake designer sunglasses you are constantly reminded of the fact that you are a fraud, the crime never goes away, is always present to us and our sense of self, as the only point of the sun glasses is to display something we are not as if we were. And this has a bad effect on our likely attitude to other situations requiring some moral fortitude. We are much more likely to say, oh, bugger it, why not? Essentially, Ariely is arguing the slippery slope. This is a truly awesome book. Not only it is very easy to read and understand, but it has study designs that are so witty, I feel I am getting smarter just by reading it. The information presented here is so important that anyone in a leadership position must be aware of this. It is very well in accord with the data from the book 'Pathological Altruism` by B. Oakley and points out some of the misinterpretations presented in `The Invisible Gorilla`. If you are interested in why people lie and che This is a truly awesome book. If you are interested in why people lie and cheat, how a bad apple can ruin the whole basket and how to prevent these, read this book. Also read this just to have some fun in human behaviors. How can such a depressing book be so much fun to read? Dan Ariely is an excellent author; I've read two of his previous books, and I haven't been disappointed yet. Ariely combines a light-hearted writing style, a solid set of psychology studies (many of which he personally conducted), and a big dose of common sense. Many of Ariely's findings are not intuitive at first glance--but he is able to explain his findings and make them understandable to the reader. Ariely shows why we cheat--but with a l How can such a depressing book be so much fun to read? Dan Ariely is an excellent author; I've read two of his previous books, and I haven't been disappointed yet. Ariely combines a light-hearted writing style, a solid set of psychology studies (many of which he personally conducted), and a big dose of common sense. Many of Ariely's findings are not intuitive at first glance--but he is able to explain his findings and make them understandable to the reader. Ariely shows why we cheat--but with a limit. We do not cheat to the maximum extent possible, even when it is possible to get away with it. Instead, most people think of themselves as honest. We cheat somewhat, but not enough to call into question our self-image of being "basically honest". The book describes a bunch of psychology experiments where subjects are able to cheat without obvious consequences, and thereby earn some extra money. Ariely does an excellent job at showing the various factors that inhibit or encourage dishonesty. He discusses cheating on tests, politicians and bankers (bankers cheat more than politicians! ), golf players (who tend to cheat a lot! ), cheating by people of different nationalities (all nationalities and cultures tend to cheat about the same amount), cheating by people in groups, and by religious people (no different from non-religious). Ariely discusses plagiarism by students, and ordered an essay on the subject of cheating from an essay mill. He received an essay consisting of gibberish that wouldn't be satisfactory for any student. He concludes that essay mills are not a problem. But, I think that this single bit of anecdotal evidence is not exactly convincing. When I was in college I learned a bit about the Simple Model of Rational Crime which basically states that people lie/cheat by rationally looking at the pros and cons and make a decision based on that. Needless to say, this never sat right with me. People don't make rational decisions, they just don't. In this book Ariely puts forth another theory, one that he calls the Fudge Factor. The theory goes that there are basically two opposing forces when we decide whether to lie or cheat. One of the fo When I was in college I learned a bit about the Simple Model of Rational Crime which basically states that people lie/cheat by rationally looking at the pros and cons and make a decision based on that. Needless to say, this never sat right with me. People don't make rational decisions, they just don't. In this book Ariely puts forth another theory, one that he calls the Fudge Factor. The theory goes that there are basically two opposing forces when we decide whether to lie or cheat. One of the forces is that we want to think of ourselves as good and righteous people. The other force is that we want to get more out of situations. So the question is: how much are we willing to "fudge" the truth and still think of ourselves as honest and good people? Through quite a few experiments, Ariely explores this, along with what may influence it in one way or another. Personally, these theories and experiments sat a lot better with me than the SMORC ever did. The author makes lying and cheating an incredibly interesting topic, and the experiments are novel and informative. The author is clearly an entertaining person and knows how to tell a good story. This book basically felt as though he wanted to show off his super-awesome experiments and findings, excitedly. It made it a fun read. My biggest complaint is that in all the experiments the reward far outweighed the consequences of being caught. What about in situations, like cheating on a spouse, where the consequences could possibly destroy lives? What about when the consequences outweigh the reward, and yet we lie/cheat anyway? Ariely, what would you make of this? : A few years back, my boyfriend at the time had a soft-top Jeep. One morning we came outside to find that someone had cut out the back window, and gotten into the car. The thief left all the expensive electronics (stereo, ipod, etc), but took all the change off the floor. It seemed like the guy had gone through quite a lot of effort for a fairly minuscule reward. METHODS, METHODS, METHODS. Just because someone says they did a study and here are the findings, it doesn't mean; a) those findings were robust or statically significant, or b) that you can generalize those findings to other phenomena. Not only were Ariely's studies extremely soft/subjective, but he actually took those extremely unreliable results and applied them to other social situations he had no business applying them too. I never know how to rate these books. The questions social scientist METHODS, METHODS, METHODS. Just because someone says they did a study and here are the findings, it doesn't mean; a) those findings were robust or statically significant, or b) that you can generalize those findings to other phenomena. Not only were Ariely's studies extremely soft/subjective, but he actually took those extremely unreliable results and applied them to other social situations he had no business applying them too. I never know how to rate these books. The questions social scientists want to answer are so interesting, worth 5 stars. The methods they employ to try to answer those questions are often so lacking that it is grossly irresponsible to publish the “findings," making me want to give it one star. Ariely was attempting to understand ethics (a very subjective subject to begin with) and provided subjects with fashion (brand name) sunglasses and perceived knockoff sunglasses (even though all sunglasses were real). Subjects then underwent his matrices solving condition (which I do not believe tells us anything at all about the real world to begin with) and those who believed they were wearing knockoffs cheated more. If you gave me a knockoff pair of sunglasses, jeans, purse, ring and told me outright it was generic, which cost a few dollars, I would find it more ethical than spending hundreds or thousands of dollars to prove I am a superior human being by wearing the expensive name brand item you gave me. It could reasonably be argued that people who hoard money in order to walk around looking like a superior human being by branding themselves with labels other people could never afford are far less ethical than people wearing generic items. After providing his findings about the dubious ethical nature of people who wear knockoffs, Ariely suggested you should be weary of your date if s/he wear a knockoff. So, is the "scientific" message is that only very rich, self-important people are honest? Just as troubling, Ariely is fond of the type of studies made famous by Adrian Raine. A few years ago, Raine, who studies psychopaths but professes not to be one, was caught luring young Asian girls to hotel rooms with the promise of possible admission to Penn. How did he escape the #MeToo movement? I have no idea. His science is just about as bad as his behavior. Raine studied antisocial personalities by going to a temp agency because, as we all know, if you work at a temp agency, you are probably a psychopath. Not only that, but we know that a trait of all psychopaths is lying. However, Raine, who equated psychopaths with temp workers, gave the "psychopaths" a *self-report" questionnaire. Self report is *never* scientifically robust, ever, but self report for people you hope are liars? Raine took the self report answers as truths. Think about that. Self report is bad to begin with. But giving self report to weed out the lairs, how is that going to provide any type of sample you can trust? Adrian decided they were liars AND that he would trust their self report. From the subjects identified through self-report, Raine imaged his little sample of antisocial folks and presented his "neuroscientific findings". People love it because they don't think about how he got those findings. Ariely included a study that makes this very claim, and he loved it! He did not think about it critically, at all. I could add to this sampling any and all matrix experiments carried out by Ariely. This book was supposed to be my downtime book, the book I read while falling asleep. I was so worked up that I had to change it to a non-downtime book. It's strange to say, but I never expected a book on dishonesty to be so tame...even small. (1) We're not purely rational cheaters; we usually don't cheat to the fullest extent possible, we typically just fudge things in our favor. Thus, we're also sensitive to self-image. (2) We cheat much less when we're given subtle reminders It's strange to say, but I never expected a book on dishonesty to be so tame...even small. (2) We cheat much less when we're given subtle reminders of our moral codes (or any moral codes). (3) We are more likely to take advantage of "fuzzy" reality to fudge in our favor. (4) Small acts such as wearing counterfeits makes larger forms of cheating more permissible. (5) Creative people tend to be more dishonest. And there are more main points. I like that the book draws conclusions from the author's own experiments. I've read many good books recently that tackle big questions. But most of them have had to tackle those big questions by drawing from a variety of research that is already available, usually with small additions from their own experiments. This book, on the other hand, is based almost entirely on experiments conducted and designed with colleagues. And the conclusion, the "Fudge Theory of Cheating", that people tend to cheat only to the extent that they are able to maintain their own image of virtue appears to be (provisionally) valid across a range of cultures. So...nicely done. And yet, I still think it's only the beginning of a useful theory. A next version of this book would have to answer pertinent questions: What is the difference between normal fudgers and full-on sociopaths; when do fudgers become full-on cheaters; what is the relationship between shared social norms and cheating (or culture); how does group competition influence cheating...if the author can tackle these questions, I believe he'll be closer to an actual theory of cheating. So, when I say the book is tame, I mean that there is no tackling big important questions about morality. There is no consideration of Hannah Arendt's "Banality of Evil" -- how normal people can come to perpetrate mass atrocities; or how good-intentioned individuals come to rationalize their way into evil. The book is also mute about larger questions of governance and social ontology. What happens when we live in places that are weakly governed or where there are fewer shared norms? How do well-governed places with shared understandings of the world break apart over time? As an International Relations scholar, I've had to consider issues of nation or organization-wide corruption, regime-building, nation-building, and cooperation within anarchy...the themes here seem small (sometimes artificially made so), and that is one of the problems of positivist science...you can only make these kind of judgments when the world is made small. Also, I feel like the book is incomplete without talking about prospect theory. In most of the experiments, cheaters cheated to get small gains, but prospect theory shows that people will take much higher chances to rectify perceived losses. Prospect theory should be an important part of this book because it could help to fill in an important theoretical puzzle -- why do we just cheat a little bit? If people are more sensitive to losses than gains, then this might explain why we only cheat a little. Perhaps something makes us cautious about punishment (even when we can't see it or we're not sure what the punishment is). But six years from the book's release there is an even bigger problem: What happens, as has happened now, when there is an utter nation-wide moral collapse...when no amount of honesty, lying, cheating is too absurd and a group wants to change the very definition of morality to fit their habitual cheating, lying, and deceit? What happens when -- by ideology -- cheating is something only your enemy can ever do? Through thorough research and interesting ideas, Ariely brings deception into a new light and tells how we all humans are susceptible to dishonesty as long as it doesn't interfere with our moral standards. Also, I like how the author does not alienate his audience through the encrypted language of academia yet still keep the sophisticated and informative edge. I “cheat” on crosswords. I don’t cheat, exactly. I don’t look at the answer key; THAT would be Cheating, with a capital C. Instead, I cheat with a lower case c; I Google or Wiki the subject of the difficult clues online. This only works for clues with keywords like an author’s name or a movie title, but the answers I find give me enough forward motion to continue solving the puzzle. If I get stumped again, I scan the clues for more keywords again. I don’t consider this letter-of-the-law Cheating, because I am working to find the solutions instead of just getting them from the answer key. You may be a crossword purist who is appalled at my lack of morals. You’d be making a mistake, though, to think my morals (when it comes to crosswords) are based on the same assumptions you hold. It all comes down to why I do crossword puzzles in the first place. You, M. Purist, may crave the challenge and the self-esteem boost when successfully completing a NYT Friday entry. I, on the other hand, find it relaxing to lazily Internet-search trivia and methodically fill in the tiny squares with the gems I find, while learning a bit in the process. Am I cheating myself? I don’t think so. After all, I’m learning things and relaxing. I’m not entering any crossword competitions. I’m not even going for bragging rights. For me, crosswords are a rote exercise. My methods work for me. In fact, M. Purist, I think your snobby morality about how crosswords should be done is elitist and exclusionary. Upon hearing my theories, one crossword-abandoning friend of mine lit up with discovery. She had stopped doing the puzzles because their difficulty proved unsurmountable, but when we talked she realized she’d been cheating herself out of a fun pasttime because of her overblown sense of “what’s right” in crossworddom. Call us cheater-mcgeeters if you must, but my friend and I are happily googling away our grids. Duke researcher and EBE (Economic Behaviorist Extraordinaire) Dan Ariely may side with the crossword purists on this one. In his latest book, The (Honest) Truth About Dishonesty: How We Lie to Everyone–Especially Ourselves (THTAD), Dr. Ariely cites his own research and research of close colleagues on the subject of cheating. From “Fun with Fudging” and the “What the Hell Factor,” Ariely examines many different ways we cheat consciously and unconsciously. His clever experiments are great at catching unwitting people at the pervasive self-deception that none of us seem to be able to resist. The book is probably his toughest read yet. I found Predictably Irrational to be a fun and delightful read. The Upside of Irrationality was a tiny bit more challenging. THTAD is by far the most research and dilemma-heavy of the 3. Perhaps it is the subject matter and being faced with my own shortcomings, but it seems this book had the least amount of engaging anecdotal evidence of Ariely’s signature storytelling charm. While reading THTAD, many times I found myself fading, in that reading-college-textbooks-at-midnight way. I don’t recall this feeling with the other two books. My meandering could be the disgust factor at work. Ariely mentions Enron and Bernie Madoff, as well as Wall Street and the 2008 crash, then goes on to explain how cheating can be social and become contagious. It’s hardly light fare, despite Ariely’s attempts to soften the blow with his self-deprecating and at times mischievous humor. Nonetheless, I read the book carefully in its entirety, even though I’d have to backtrack often to where my mind checked out and begin again; Ariely’s insights into human behavior are useful in life and in business. In this book, I learned why I shouldn’t trust the car repair guy I’ve known forever, why I should draw pictures of eyes and hang them on the snack cabinet, why a stack of dollar bills are more likely to stay in tact than my lunch in the work fridge, and why, as a creative person, I may have less gray matter in my brain than you dull types out there. Where the book falls short, besides the lack of Ariely’s personal stories, is in the area of some needed philosophical talk about morals. Ariely hints at the possibility of varying moral codes when he talks briefly about the perception of cheating in different cultures, but he fails to lay down a common compass from which we all discern our moral directions. Ariely assumes we’re all following a letter-of-the-law approach to Cheating, and that his experiments’ subjects could only be following that same (supposedly Judeo-Christian) approach. But I think Ariely would’ve done well to take a paragraph or two to lay out his assumptions/biases. We can surely infer the basic Western moral sense, but if Ariely took some time to lay out what exactly he thinks is the official definition of “Cheating”, even if only within the confines of his own experiments, his assertions about how we all unconsciously cheat would hold all the more punch. Although his matrices experiment designs seem pretty rock solid, there is a possibility that Ariely may have missed two totally different motivations behind cheating: etiquette and convenience. In Chapter 9: Collaborative Cheating: Why Two Heads Aren’t Necessarily Better than One, Dr. Ariely presents some findings that suggest we cheat more with others and/or for others’ benefit (“altruistic cheating”). Earlier in the book, he also cites “karma” as a way we justify taking a few extra pens from work when they failed to give us our yearly bonus. But I think this is where Ariely missed an opportunity to explore the finer-tuned aspect of cultural etiquette and convenience. Sometimes certain behaviors are expected for reasons unknown to us, but we’re savvy enough to pick up on signals sent by those around us. For example, in Ariely’s bad-actor experiment (the actor David portrayed “bad” decisions, not that David was poorly skilled at theatrical arts). When David asked whether or not he should cheat, the researcher said, “You can do what you want.” David then obviously cheated and was not rebuked. This is such an odd occurrence in life, it’s possible that the real subjects in the experiment may have surmised that the researcher actually preferred (for whatever mysterious reason) that the subjects cheated. Perhaps it would get her the results she wanted. Who would deny her? It would be more polite, then, to do what is expected and cheat like David (or find a moral middle ground and cheat a little more than normal, which is what the subjects did). Another experiment Ariely cited was done in a coffee shop. Customers were handed too much change, and Ariely wanted to see how many people would return the excess, and how much of it they'd return. I’m deeply familiar with this very scenario, because I’ve experienced it more than once with my fanatically scrupulous father, who has been known to get into restaurant-silencing arguments over bills for being undercharged. Those cringe-worthy moments of my youth taught me that it’s better etiquette to leave a heftier tip in case the waitstaff notices the error later than to argue that we need to pay more. Perhaps Ariely would just call this "picking-up-on-signals" the collaborative effect, but I find it slightly different than what he describes as “group cheating” in the book. I run into a collaborative effect everyday here in the suburbs, but again, it isn’t group cheating as much as it is a cultural norm. Take the library loans of music, for example. I am under the impression that if I check out Nicki Minaj’s lastest CD, I am to listen to it but not download it. If I download it to be able to listen to it, I should delete the album when I return the CD to the library. My father and my brother (also a stickler) would delete the files. They would also argue (probably loudly) with people on the street about how everyone should delete any music not bought through legitimate outlets. But if word got out around my town that I was making my tween delete the music she borrowed from the library, I’d get the reputation of an overly strict, trifling and somewhat-crazy parent. Put simply, it would be just plain weird. Another example of this peer-pressure-to-accept-certain-rules is living in an organized-crime dominant area, which I did growing up. I dare not talk about it too much (for obvious reasons), but I will say that our views on the definitions of “crime” and “wrong” didn’t necessarily match up to say, a nice Midwestern Mayberry-type town’s views. We thought of ourselves as looking more at the big picture: The police? They weren’t the most “upstanding” group. Electronics companies? What, the ones with the child labor in Indonesia? Bankers? Don’t get me started! We were keeping a whole region of the state, thousands of families, afloat, mostly via legitimate means. What were all those people doing for anybody? Who wants a stickler around, anyway? Rule-followers, pencil-pushers, Miss Manners, they only see right in front of their own noses. Where I come from that’s a very immature (and definitely no-fun!) way to be. Ariely does mention the social aspect behind cheating, as I said. And I may just be lying to myself, as he would say. But I do believe there are subtle signals we send to each other that tell us how we are expected to behave, and I wonder if any of those signals came into play in Ariely’s experiments. This isn’t the strongest of criticisms, of course. It’s a trifling point, a fixation on minutiae, a party-pooper whine. But I guess, like my father, I’m set to be the one that messes up everyone’s good time. Tomorrow I’ll be sitting in on a conference with Dan Ariely. I’ll let you know how it goes. In the meantime, let me know if you have any questions for him. We all admit to telling ‘white lies’ or cheating/bending the truth and usually, several times a day. How often do we admit to (and even realize) that we also lie to ourselves to the point of believing our own dishonesty? Best-selling author, professor, and cognitive psychologist Dan Ariely explores the topic in, “The Honest Truth about Dishonesty: How We Lie to Everyone- Especially Ourselves”. Ariely instantly dives into thought-provoking and interesting dialogue regarding the topic of dishonest We all admit to telling ‘white lies’ or cheating/bending the truth and usually, several times a day. How often do we admit to (and even realize) that we also lie to ourselves to the point of believing our own dishonesty? Best-selling author, professor, and cognitive psychologist Dan Ariely explores the topic in, “The Honest Truth about Dishonesty: How We Lie to Everyone- Especially Ourselves”. Ariely instantly dives into thought-provoking and interesting dialogue regarding the topic of dishonesty combining cognitive psychology, behavioral psychology, and elements of neuroscience; while presenting this in an accessible way that is easy-to-understand for all pop-psych readers. The resulting product is a fast-paced text tinged with humor. The negative side of this is that “The Honest Truth about Dishonesty” is too basic and simplified; not elaborating or diving deep enough. Oftentimes, the information feels ‘obvious’ and abruptly cuts off before the true connections are made or theories are proven. This causes the facts revealed inside “The Honest Truth about Dishonesty” to be less than memorable and not mind-blowing. On the other hand, the most striking (and applauded) feature of “The Honest Truth about Dishonesty” is the fact that almost all of the experiments/tests described are first-hand conducted either by Ariely or his immediate peers. This is highly notable and makes the book stand out, as most other books nearby on the book shelf tend to be filled with secondary sources and experiments which aren’t related to the topic at hand (many psych books use the same experiments but describe them per their own theories making the arguments weak). Thus, Ariel’s research and expertise on the subject makes the text more credible. On a related note, Ariel stylistically includes some of the actual documents/tests/charts used in the experiments and even encourages the reader to try them personally again helping to put “The Honest Truth about Dishonesty” on a ‘fun’ and approachable level. Ariel’s writing weakness is a certain level of choppiness within the text bouncing around on the topic within chapters – sort of like a book that is ADHD. Although this doesn’t make “The Honest Truth about Dishonesty” confusing; it does break reader attention. Slightly past the halfway point, “The Honest Truth about Dishonesty” loses some steam as Ariely begins to cite more personal observational studies versus hard science having little backing and explanation. The text also becomes quite repetitive causing the entire reading to be somewhat slow and without any excitement or merit. The final chapter of “The Honest Truth about Dishonesty” sums up some of Ariel’s theories and offers tips concerning the battle with dishonesty. Sadly, these suggestions are bare-boned and thus the conclusion feels weak and forced. This flows into a unique compilation of mini biographies of Ariely’s fellow collaborators (including personal information about how the author knows each). These pages are unique as I have not seen this in other psychology books. Sadly, the notes and bibliography are shamefully thin and take away from the credibility and academic value of the text. Overall, “The Honest Truth about Dishonesty” is a relatively well-written work (flows smoothly and is entertaining) but some execution flaws are apparent. The text could have also been strengthened with more detail and elaboration but this makes it a strong introduction on the topic to the general reader. “The Honest Truth about Dishonesty” isn’t ‘bad’; it just isn’t a life-changer. Regardless, “The Honest Truth about Dishonesty” is suggested for those interested in the social sciences, behavioral economics, and psychology; seeking a quick but interesting read. The honest truth is, we are all dishonest. I want to share a real life scenario that happened with me just yesterday right after I finished reading Dan Ariely's new book The Honest Truth About Dishonesty. The situation: An anonymous person at our office refills the office refrigerator with a dozen small water bottles, everyday. They’re stacked in the top compartment on their own, unlocked, unmarked, un-anything. They’re just there. Sinister, isn't it? Next to that fridge are two water coolers that The honest truth is, we are all dishonest. The situation: An anonymous person at our office refills the office refrigerator with a dozen small water bottles, everyday. They’re stacked in the top compartment on their own, unlocked, unmarked, un-anything. They’re just there. Sinister, isn't it? Next to that fridge are two water coolers that are obviously for everyone to use. So who are the bottles for? The reasoning: In terms of water consumption, I personally prefer having a bottle on my desk rather than walking back and forth to the kitchen for a glass of water. At other times, I either forget, or get too lazy to get my own supplies, and that’s when my dishonest behavior kicks in. The bad behaviour: I found that I was occasionally opening the fridge and helping myself to one water bottle knowing that they belonged to someone else. In the beginning it was discreet but after going unnoticed for so long, I gradually stopped putting effort in hiding and carried on believing that I was actually entitled to a free bottle of water from our shared office fridge. I’m not sure if I was the only one taking a bottle, but let’s just say I wasn’t. Yesterday, I confidently made my way to our lovely pantry, opened the fridge, and there it was! A warning note that read, “Please don’t touch!” *ominous music* I didn’t dare touch anything this time, even when there was no one around. I then spent the rest of the day hiding under my desk anticipating arrest and imprisonment. This is the general idea of the book (without going into spoilery details.) The author, Dan Ariely, whose previous bestsellers include Predictably Irrational and The Upside of Irrationality, conducts different experiments in similar situations to mine, low-risk, low-stakes scenarios where sometimes there are no consequences whatsoever to being dishonest, and then he uncovers some pretty shocking truths regarding just how far we would go as supposedly "honest" people. It’s a 10-chapter popular psychology book that covers various situations, contexts, and settings that affect human behavior and decision-making when it comes to being dishonest. Ariely is known for his cheerful writing style by which he usually includes his personal stories in between experiments and eases off scientific/psychological analyses for the light user looking for a good read. This funny, fascinating, personal paradigm shattering book is in a genre I love, books that make me examine my thinking process, but this one caused me more soul searching than any other I’ve read. According to the Simple Model of Rational Crime (SMORC) we decide whether or not to be dishonest based on a logical, mathematically calibrated cost-benefit analysis, and we’d all be as dishonest as we could be as long as it brought us a benefit greater than the likely cost. Fortunately, author Dan Ariely discovered that people aren’t as cold-bloodedly calculating as that. Unfortunately, the news about human morality isn’t all good. Ariely is very skilled at conceiving, conducting and describing experiments that tease apart the tangle of human motivations. According to what he’s discovered, we’ll cheat, lie and steal, but only as much as we can rationalize because we want to be able to feel good about ourselves. We’re all capable of dishonesty, and being natural story tellers we’re extremely adept at creating perfectly logical seeming explanations justifying our less than moral actions, though we rarely understand exactly why we make the choices we do. We invariably underestimate how much we are influenced by a myriad of circumstances ranging from conflict of interest to how tired we are feeling. Since we want to see ourselves as good, most of us never stray far from the straight and narrow path, but small frequent transgressions can create bigger problems than the egregious acts of a few bad apples. Our collective peccadilloes can wreck havoc, but with an improved understanding of the situations that increase dishonest behavior Arliey hopes his book can be a guide for corrective actions and legislation. My rating is 5 because it is that kind of book which made me reflect upon my own behaviour. On the one hand, because of some mistakes and the stories I told to myself, and on the another hand because it was a confirmation for the times I felt really bad, as I was aware of my action. First thoughts when trying to predict what is the book subject, were that it's most probably a book about cheating in relationships and cheating for becoming richer. Sorry to disappoint you, but it's not about cheati My rating is 5 because it is that kind of book which made me reflect upon my own behaviour. On the one hand, because of some mistakes and the stories I told to myself, and on the another hand because it was a confirmation for the times I felt really bad, as I was aware of my action. First thoughts when trying to predict what is the book subject, were that it's most probably a book about cheating in relationships and cheating for becoming richer. Sorry to disappoint you, but it's not about cheating in relationships as you might have expected too. Instead, you get some conclusions based on experiments. I was always expecting numbers, but by the end of the book you get a sense that Dan is critic enough not to draw conclusions out of superficial experiments. - that the cheating level is about the same in different countries (experimented in USA, Israel, Italy, Turkey, Canada and England). "Most people cheat just enough to still feel good about themselves." I feel a little bad about the three stars. I enjoy Dan Ariely's entertaining and informative books about behavioral economics and the many ways in which we are far less rational than we want to believe. Exploring the topic of honesty from a variety of angles appeals to me as well, and true to form, Ariely highlighted many interesting aspects of honesty/dishonesty -- contagion of dishonesty, how a sense of altruism and collaboration can facilitate dishonesty, the relationship between creativity a I feel a little bad about the three stars. I enjoy Dan Ariely's entertaining and informative books about behavioral economics and the many ways in which we are far less rational than we want to believe. Exploring the topic of honesty from a variety of angles appeals to me as well, and true to form, Ariely highlighted many interesting aspects of honesty/dishonesty -- contagion of dishonesty, how a sense of altruism and collaboration can facilitate dishonesty, the relationship between creativity and lying, how a sense of depletion or deprivation can use up valuable will power so that we have fewer resources for self-control to do the right thing, etc., etc. So why only three stars? I think a lot of it was that audio was probably not the ideal venue for this book, at least for me. Although I can enjoy popular nonfiction on audio, it can also be a bit of a harder sell. Other goodreaders complained about Ariely's repeated use of a matrices test as a stimulus for measuring cheating. I can't really blame Ariely for reusing the same test if that's what worked, and the point wasn't the test itself but what he was exploring. So I don't think that was the problem, but I'm not sure why I occasionally felt overloaded and overwhelmed with research descriptions and data and wanted more narrative. In all honesty, this book was a letdown. The human propensity for lying and cheating should be a juicy topic, but Ariely manages to squash reader interest by (mostly) confining his experiments to sterile classrooms, where one group of student volunteers after another pencil in answers to one dull test after another, usually involving dotted matrixes, one-dollar bills, and paper shredders. When Ariely and colleagues DO leave the artificial environment of the classroom –- sending a blind girl into In all honesty, this book was a letdown. The human propensity for lying and cheating should be a juicy topic, but Ariely manages to squash reader interest by (mostly) confining his experiments to sterile classrooms, where one group of student volunteers after another pencil in answers to one dull test after another, usually involving dotted matrixes, one-dollar bills, and paper shredders. When Ariely and colleagues DO leave the artificial environment of the classroom –- sending a blind girl into a farmers’ market to buy tomatoes, for example –- their research yields some interesting results. But back to that classroom … our intrepid social scientist’s big discovery is this: We all cheat, but only a little bit. And if we can just get a few reminders that cheating is bad, maybe we won’t do it so much. That’s not exactly a scientific breakthrough; it’s simple common sense. And that’s the brutal truth. مثل همه کتابهای دن آریلی عالیه اما پیشنهاد اکید من این هستش که حتما نسخهی زبان اصلیش رو بخونین. متاسفانه رفته رفته ترجمهی کتاب نامفهومتر میشه. اوایل با نامفهوم بودنش کنار میومدم اما یه جایی رو هرچند بار که خوندم نتونستم متوجه بشم و دست به دامن نسخهی زبان اصلی شدم تا منظور دن آریلی رو بفهمم. اونجا فهمیدم نه تنها مترجم نه تنها نتونسته مفهوم رو درست منتقل کنه، بلکه حتی بعضی جاها رو اشتباه گفته. ضمنا از جملاتی که کلا ترجمه نکرده بگذریم. نمونه: صفحهی ۱۲۸، پاراگراف آخر نوشته شده «داوطلبین به طور متوسط د مثل همه کتاب‌های دن آریلی عالیه اما پیشنهاد اکید من این هستش که حتما نسخه‌ی زبان اصلیش رو بخونین. متاسفانه رفته رفته ترجمه‌ی کتاب نامفهوم‌تر میشه. اوایل با نامفهوم بودنش کنار میومدم اما یه جایی رو هرچند بار که خوندم نتونستم متوجه بشم و دست به دامن نسخه‌ی زبان اصلی شدم تا منظور دن آریلی رو بفهمم. اونجا فهمیدم نه تنها مترجم نه تنها نتونسته مفهوم رو درست منتقل کنه، بلکه حتی بعضی جاها رو اشتباه گفته. ضمنا از جملاتی که کلا ترجمه نکرده بگذریم. نمونه: صفحه‌ی ۱۲۸، پاراگراف آخر نوشته شده «داوطلبین به طور متوسط ده ماتریس کمتر ... گزارش دادند» در صورتی که نسخه زبان اصلی گفته شده داوطلبین به طور متوسط ده ماتریس گزارش دادند. Either 3.8/5 or 4.2/5 . complex theories & technical jargon. He discussed psychology behind dishonesty. And if you think about it you'll see that many fundamental cues behind dishonesty are accepted as normal behavior or treated as an open secret. For example, in lab experiments when the result seems to be Either 3.8/5 or 4.2/5 . complex theories & technical jargon. He discussed psychology behind dishonesty. And if you think about it you'll see that many fundamental cues behind dishonesty are accepted as normal behavior or treated as an open secret. For example, in lab experiments when the result seems to be incorrect, we do some back calculations, fudge the data to make the result look right or give proxy attendance for our friends or classmates who are absent in the class. And even in larger scale, nationwide cheating in public exams by leaking question papers before the exam! And so on. Dürüstlük her zaman sorgulanagelen bir kavram. Bu kitap da cok güzel somut deneylerle ve verilerle bu kavramı biraz daha iyi anlamamızı sağlıyor. Dili, akılcılığı ve mantıklı ornekleri ile bir cok noktada ufuk açtığı gibi cok detayli düşünmemizi sağlıyor. Daha iyi bir review ve bir kez daha okumayı hak eden müthiş bir kitap. The reasons why we lie and to what extent we’re willing to lie are pretty fascinating, and if you haven’t read anything else of the sort before, this might be pretty revelatory. Ariely explains the various studies and results pretty clearly, and it’s definitely not aimed at people who have actually dug into the academic publications: it’s accessible to a layperson, definitely, and to my mind pretty much aimed at the layperson. At any rate, I didn’t find any of it surprising, because I’ve read mo The reasons why we lie and to what extent we’re willing to lie are pretty fascinating, and if you haven’t read anything else of the sort before, this might be pretty revelatory. Ariely explains the various studies and results pretty clearly, and it’s definitely not aimed at people who have actually dug into the academic publications: it’s accessible to a layperson, definitely, and to my mind pretty much aimed at the layperson. At any rate, I didn’t find any of it surprising, because I’ve read most of this before and know something of the way we’ve discovered our brains work. I’m not 100% positive there was nothing new, but there wasn’t much that didn’t sound familiar. So, a good read if you’re looking for something on the subject, but probably not much point if you’re already pretty aware of research into dishonesty and why we lie. * Standard classical model of dishonesty/cheating is SMORC – simple model of rational crime – which says we cheat when it's in our rational interest. EV is positive, or expected payoff is greater than the risk of getting caught and the associated punishment. * SMORC is false. Ariely calls his alternative the "fudge factor" theory, which basically says that cheating is rampant in all scenarios, whether the payoffs are big or small, but only by small amounts. People cheat just enough so they can still tell themselves they are still good people. Even when there is zero risk of getting caught. * Probably the most interesting thing is just how common cheating is by these small amounts. I think it conflicts with how most people think about it. To be published in June of 2012 (DWD's Reviews received an uncorrected proof advance copy) by Harper. 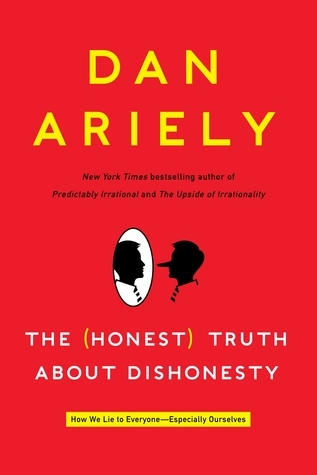 Dan Ariely's The (Honest) Truth About Dishonesty is a fun look at a serious topic - lying. Ariely, a professor of behavioral economics at Duke University, describes his simple experiments and details his results in a light, easy to understand way. His results are often surprising and counter-intuitive. For example, it is often considered that people are dishonest because they have calculated the To be published in June of 2012 (DWD's Reviews received an uncorrected proof advance copy) by Harper. For example, it is often considered that people are dishonest because they have calculated the risk of being caught and the reward if they get away with the dishonesty and act accordingly. Ariely demonstrates that this is incorrect and spends the rest of the book showing what conditions are more likely to cause dishonest behavior and what conditions decrease dishonesty. This could have been a stupefyingly dull book, but Ariely deft touch makes it a very fun and very quick read. Loved the newest installation from Dan Ariely. I'm a huge fan so I'm already biased, but this book was a breezy read and very insightful. It was also disturbing and slightly distressing, as the main premise is that most harm to society comes from normal people each cheating just a little bit, then rationalizing it to fit in our personal "fudge factor". With connections to many great researchers, including Roy Baumeister of "Willpower" fame (among others), Ariely presents a delicate balance betwe Loved the newest installation from Dan Ariely. I'm a huge fan so I'm already biased, but this book was a breezy read and very insightful. It was also disturbing and slightly distressing, as the main premise is that most harm to society comes from normal people each cheating just a little bit, then rationalizing it to fit in our personal "fudge factor". With connections to many great researchers, including Roy Baumeister of "Willpower" fame (among others), Ariely presents a delicate balance between wanting to conceive of ourselves as honest human beings and wanting to maximize gain. Ego depletion and the "what-the-hell" effect can induce us to cheat more. Even creativity is not safe, as Ariely's inventive experiments include one that shows a correlation between lying and creativity: the more creative we are, the more creative stories we can spin to justify our behavior. I will point out one issue that bothered me throughout the book, and which Ariely briefly mentions near the end of it: the "matrix" task on which a large portion of these experiments relies on, is not really a task that people perform on a regular basis. It's possible that cheating in laboratory conditions is higher (or lower! as in the cultural comparison Ariely discusses) depending on the context in which people are in. It would be fascinating to see if the conclusions would hold in more mundane, everyday tasks. All in all, a great book and highly recommended, especially for Ariely aficionados. If you're thirsty for more Ariely and have finished his other books, you should also check out his free Coursera class. "The (Honest) Truth About Dishonesty: How We Lie to Everyone - Especially Ourselves" by Dan Ariely is a fascinating look at cheating and dishonesty. Backed by research, Ariely provides explanations for the unethical behavior that seems to be endemic from Washington to Wall Street, the classroom to the workplace, and everywhere else you turn. It is interesting to see that irrational forces are often behind whether we behave ethically or not, and cheating and dishonesty are not merely derived from "The (Honest) Truth About Dishonesty: How We Lie to Everyone - Especially Ourselves" by Dan Ariely is a fascinating look at cheating and dishonesty. Backed by research, Ariely provides explanations for the unethical behavior that seems to be endemic from Washington to Wall Street, the classroom to the workplace, and everywhere else you turn. It is interesting to see that irrational forces are often behind whether we behave ethically or not, and cheating and dishonesty are not merely derived from a cost-benefit analysis. The more engaging element of this book is Ariely's ability to make his research interesting, engaging, and relevant. It was not only an educational book, but a very engaging and entertaining one too. One of the many things I found interesting was the conclusion from an experiment that suggested that the probability of getting caught doesn't have a substantial influence on the amount of cheating. This is just the opposite that I thought would happen and that I suppose many others would believe too. The book explores why we cheat others and why we cheat ourselves. One especially interesting part were the findings of how people only cheat "a little bit" so they can still consider themselves honest and good. It was also interesting when some experiments showed people would cheat to help others more than themselves, and at other times how certain things such as reminding people about honesty could decrease the amount of cheating. The opposite is also true, with findings that wearing "fakes" can lead us to cheat more. Think having a stronger relationship with a professional will reduce the likelihood of the professional acting for a self-interest when faced with a conflict of interest? Think again! The chapter on conflicts of interest and being blinded by our own motivations sheds some interesting light on this topic as well. I thoroughly enjoyed reading this book, and it explained occurrences I've seen in others and myself. It provided information for me to use when maintaining my own honesty as I try to raise honest children and influence others with ethical behavior. As the author concludes, once we better understand what really causes our less-than-optimal behavior, we can start to discover ways to control our behavior and improve our outcomes. Ariely's "The (Honest) Truth About Dishonesty" is definitely a start to better understanding what really causes cheating and dishonesty, and it is a book I recommend highly to anyone interested in this field of study. A really great look into the current research into how/why people cheat/lie to other people and even to themselves. The book is well written, well paced and I personally think the topics discussed are fascinating. His writing is easy to understand and has a playful entertaining tone. His anecdotes always add to the topic being discussed - unlike Daniel Kahneman, Nobel prize winner A really great look into the current research into how/why people cheat/lie to other people and even to themselves. The book is well written, well paced and I personally think the topics discussed are fascinating. His writing is easy to understand and has a playful entertaining tone. His anecdotes always add to the topic being discussed - unlike Daniel Kahneman, Nobel prize winner and mentor to Dan Ariely, who drones on and on about himself and his co-researcher for no good reason in his book "Think Fast and Slow". All of the area he discusses are support by actual research that has been done, often himself - versus someone like Malcolm Gladwell who is more of a journalist looking to "collect interesting stories." Instead of just throwing unsupported conclusions at the end, he actually tries to apply the findings of his research in the real world(like getting people to not cheat on taxes or their insurance claim). There are some areas he is interested in, but admits he can't talk too much about them, because he hasn't been able to do any experiments to test his hypothesis (never stopped Malcolm Gladwell... or Steven Dubner on global warming in Superfreakomics, a disappointing followup to Freakonomics). He does a lot of followup studies to try and answer questions left open from his initial results. That is he doesn't take it for granted that you will automatically accept his finding as correct. On the flipside, he has often noted that some people have commented that the results of research as "obvious." So instead he had people predict what his findings before giving that actual results. It turns out if people are not "forced" to commit to position before finding the "correct" answers, they delude themselves that they "knew it all along" - he devotes an entire chapter to this. BTW, that's why you do so well on those magazine quizzes that have the answers on the back page. I absolutely loved this book because of the author’s interesting findings, easy to read style, and outside applications. Although many of the studies c I absolutely loved this book because of the author’s interesting findings, easy to read style, and outside applications. Although many of the studies conducted by the author, Dan Ariely, are in a laboratory, many of his findings can be generalized to majority of the people in many countries (he proved this by explaining one of his experiments that he conducted internationally). Not only that, but he also includes past experiments from other researchers, and a field study that he conducted with the help of his friends to find out why people cheat/lie. This book is also very easy to read and because it is around 255 pages, you can quickly finish it and understand much of the content. This is very good, especially if you want to research more about the topic of human morality, dishonesty, cheating, and etc. If that's not enough, the author inputs many of his own dishonesty and shows the reader that he is also human and isn't immune to many temptations of cheating that we all face. He proves that we are all cheaters and liars in multiple situations. Although there are ways to decrease cheating and lying, there are also ways to increase it (and about 2 ways to neither decrease nor increase the amount of cheating/ lying, even though our intuitions claim these two ways have an effect to it). Since reading this book, I will actively try to become more moral, especially as I grow up, therefore I recommend this book to anyone and everyone so as a society we can grow from understanding ourselves better. I read this book in one sitting. It is a fascinating look into the inherent dishonesty that lies in all of us. We all cheat. Just a little. White Lies, Pens from the office, travel expenses, etc. But what is interesting is what allows us to cheat; What factors are in place that let us choose to cheat and by how much we will cheat; And how we trick ourselves into rationalizing our cheating. It's a bit disheartening, and perhaps a bit relieving, to know it just apparently in our nature and that to I read this book in one sitting. It is a fascinating look into the inherent dishonesty that lies in all of us. We all cheat. Just a little. White Lies, Pens from the office, travel expenses, etc. But what is interesting is what allows us to cheat; What factors are in place that let us choose to cheat and by how much we will cheat; And how we trick ourselves into rationalizing our cheating. It's a bit disheartening, and perhaps a bit relieving, to know it just apparently in our nature and that to control it we need to be monitored. The book is an easy, entertaining and quick read. Like many of these types of books, in order to fill up pages there is a small amount of repetitiveness. But not nearly so much as others I could name that fill up 40 to 50% of the book by repeating themselves. A must read on Behavioural Economics/Psychology. Dan Ariely explained how we cheat and how we find excuses for all our little lies. I was impressed by Dan's so-called "Fudge Factor", and other factors on his experiments that make us irrationally lie. This book is absolutely fun and yet still informative. A primeira metade, ou o primeiro terço já está nos livros anteriores, e muitas conclusões grandes são tiradas de alguns experimentos. De repente, ele pode estar até usando outras fontes pra embasar as conclusões, mas não são citadas. Mas, mesmo assim, gostei. Coisas novas sobre como as pessoas trapaceiam e a influência que isso pode ter nos outros. The main thesis of this book is that people are dishonest not (purely) based on a rational analysis of the costs and benefits, but based on a tension between wanting the benefits of dishonesty and wanting to see themselves as honest people. The book also discusses a bunch of ways our dishonesty plays out in practice. For example, we are less likely to cheat if reminded of our moral standards right beforehand, more likely to cheat when the results of our cheating are indirect, and more likely to The main thesis of this book is that people are dishonest not (purely) based on a rational analysis of the costs and benefits, but based on a tension between wanting the benefits of dishonesty and wanting to see themselves as honest people. The book also discusses a bunch of ways our dishonesty plays out in practice. For example, we are less likely to cheat if reminded of our moral standards right beforehand, more likely to cheat when the results of our cheating are indirect, and more likely to cheat if we see our peers doing so. Intuitively, these main points seem clearly correct. Ariely also presents a variety of experiments and anecdotes to back up the thesis. Some of them are fairly large and realistic experiments, such as a car insurance company that randomly put a signature line at the top or bottom of a form where insured reported miles driven in the past year. (People reported more total miles, presumably more honestly, when the signature line was at the top.) Other experiments were quite artificial with unspecified sample sizes. One common metric of “cheating” Ariely used throughout the book was a task where people were shown images on a computer screen of dots and a line, and instructed to estimate whether more dots were on the left or right side of the line. However, participants were informed they would be paid more each time they guessed there were more dots on the right. Thus inaccurately reporting more dots on the right was interpreted as cheating. From this description of the setup, it was unclear to me if it was reasonable to interpret choosing “right” more often as cheating. If the experimenter is paying you more to choose “right”, doesn’t that imply they want you to choose “right”? And what would be the benefit (to anyone) of choosing accurately? I think my interpretation would depend on how exactly the task was presented, but this was not specified in either the book or the paper (which I looked up). Overall, I don’t think the book changed my mind on much because it was hard to know how seriously to take the studies when results disagreed with my intuitions. It was entertaining, though, so I didn’t really mind. برای خواندن این کتاب کاملا تسلیم باشید. شاید توضیحات مکرر انواع آزمایش‌های رفتاری کمی حوصله‌سربر باشد ولی اگر ذهن آماده‌ای داشته باشید عصاره کلام این کتاب شما را با عریان‌ترین لحظات عمرتان مواجه خواهد کرد. زمان هایی که کمی ریاکاری کرده‌اید و دروغ گفته‌اید ولی نه آنقدر که ذهنیت‌تان در مورد خودتان خراب شود. نمی‌دانم بقیه چقدر با این کتاب ارتباط برقرار کنند ولی من این کتاب را چنان خواندم که انگار او مرا خورد و قطعا یکی از گزینه‌هایی ست که بعد از چند ماه دوباره سراغش خواهم رفت و باز مطالعه‌اش خواهم کرد.